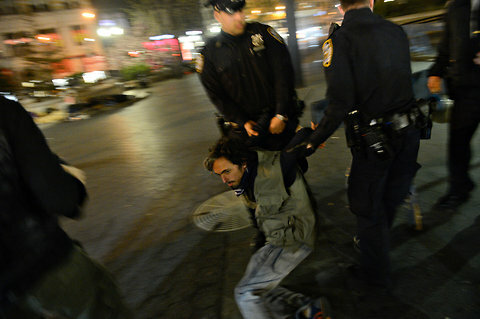 Norman Siegel, a longtime civil rights lawyer said that some public parks, including Union Square – with a long history of civil disobedience – have a 1 a.m. curfew, but that the police tend to enforce those rules selectively, which adds uncertainty and confusion about what rights apply for peaceful protest. Cops rousted about 300 Occupy Wall Street protesters camped out in Union Square Park early Wednesday, according to the New York Daily News. The demonstrators moved into the camp on Saturday, continuing the protest against economic inequality that started this summer in Zuccotti Park. "The park will be closing as of midnight. If you don't leave, you will be arrested,” an NYPD captain warned late Tuesday. Dozens of cops — some in riot gear — surrounded the park and ushered the protesters to the sidewalk. "I'm overwhelmed," said Amanda DeRoller, 22, a protester from Harlem. "I don't understand why we can’t be here. Usually the park is open 24 hours. Now they want us out, because Bloomberg says so. It makes no sense." The group quickly gathered to figure out their next move at an impromptu public meeting. "No one is doing anything wrong," said Lina Cigno, 21, of Washington, D.C. "We just want a place to protest. They are trying to get us out." Cigno said the police had no justification for the eviction. "One girl was hitting her tambourine too hard?" she asked sarcastically. Dozens of cops surrounded the edge of the park. At least two FDNY ambulances showed up, fearing violence. The crowd stood at the edge of the park chanting "Zuccotti is everywhere." The Occupiers had hoped to set up a permanent encampment, like the one on Wall Street, from which to organize more protests. City authorities were willing to tolerate the group in small numbers, but said that they cannot sit or lie down in the park if their number goes above 25. After midnight, police barricaded the park to prevent them from returning as the crowd chanted, "We are here for you too! We know what it's like to work and not have enough to eat. We don't want to fight you!" 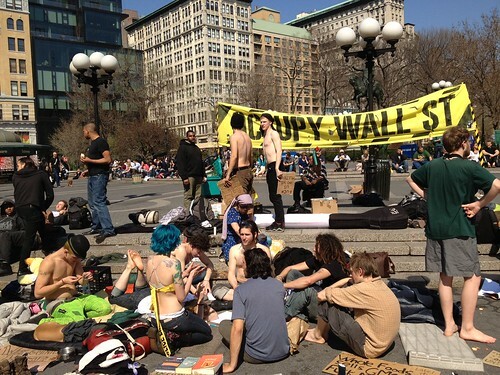 NYPD Forces Occupy Wall Street From Union Square, Closing Park For First Time Since…?